The stunning coastline is the main attraction of Brittany. 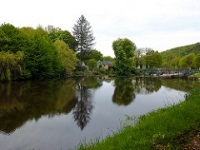 However, the region also boasts some lovely medieval villages and ancient archaeological sites and tourists will find plenty of things to see and do in Brittany apart from bask on the beach. 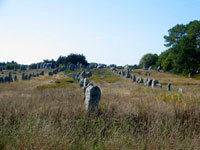 The popular holiday resort of Carnac is close to one of France's most mysterious ancient sites, a field of hundreds of massive standing stones even older than Stonehenge and the pyramids. Sun-seekers from Carnac can take a break from the beach for a fascinating excursion to see this site and the accompanying Musee de Prehistoire. Other famous coastal resort towns in Brittany include Dinard, which retains its Victorian atmosphere, and La Baule, the region's most fashionable resort. The Sentier des Douaniers is a 1,242 mile (2,000km) path that winds along the dramatic coastline of Brittany and allows visitors to take either leisurely strolls or lengthy hikes from any point on the coast. One of the most beautiful stretches, in northern Brittany, is between Perros Guirec and Ploumanach where giant pink boulders dominate the trail. 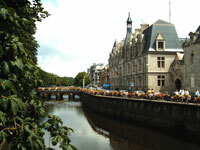 There are also picturesque and interesting cities in Brittany. Quimper, the oldest city in the region, has remarkably well-preserved medieval features. Nantes, situated on islands in the Loire River estuary, is packed full of historical attractions. Charming villages are strewn throughout the region and a particularly popular example is the medieval village of Talloires, perched on Lake Annecy, which draws visitors year round. We are looking for contributors for our Brittany travel guide. If you are a local, a regular traveller to Brittany or a travel professional with time to contribute and answer occasional forum questions, please contact us.